Your full name (exactly as it appears on your Social Security card) If your name has a suffix, such as Jr. or III, include a space between your last name and suffix. Although these questions may seem fairly straightforward, it is important to be sure to enter your information into these fields accurately. 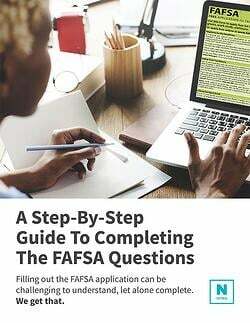 If you are sending the FAFSA to multiple schools, they will most likely have an individual record with your information that will need to match in order for them to receive your FAFSA. Be sure to enter your name as it appears on your Social Security card. Be sure to enter your Social Security number accurately. Enter your permanent home/mailing address, including home number, street, city, state and zip code. (Note: although you may use your college’s mailing address after you are an enrolled student, you will still need to use your home address when filing the FAFSA). Be sure to enter your most accessible phone number. This can be your home phone number or your cell phone number. Do not enter dashes.